Fig. 49. 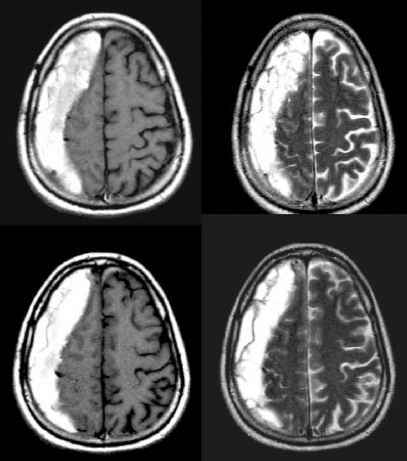 Axial T1 noncontrast MR of the brain (left) with corresponding magnetization transfer image (right) at the same level showing suppression of the background with slightly better distinction of gray and white matter. Note also the CSF flow artifact of high signal at the foramen of Monro. cific frequency that is dependent on the strength of the external field and its local environment. It is the interactions with the surrounding local molecules that causes chemical shift, most noticably between that of water and fat. The hydrogen proton of the water molecule has a slightly different electron or magnetic shielding than those of the methylene group in fatty acids; therefore a small precessional frequency shift results. In a 1.5-T magnet this chemical shift of 3.5 ppm translates approximately into a separation of 224 Hz that is detected in the frequency-encoding or readout direction (42). 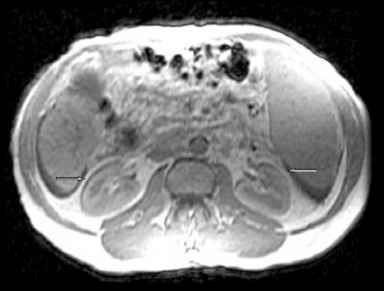 This chemical shift between water and fat manifests on imaging as spatial misregistration whereby as the imager is centered at water frequency, fat will be mapped at a slightly different site than its true spatial location, being most obvious at a water-fat interface such as the orbit and kidney. When the chemical shift misregistration is equal to or more than the size of a pixel, a dark or bright band will appear at the interface. The dark band on the lower frequency side of the interface is caused by shifting of fat proton to a lower frequency and away from the fat-water interface. On the higher frequency side of the interface, a bright band appears owing to the resulting overlapping water and lipid signals (Figs. 50 and 51). There are several ways to minimize this effect including changing the frequency-encoding direction, the field of view, or the bandwidth or employing fat suppression techniques. 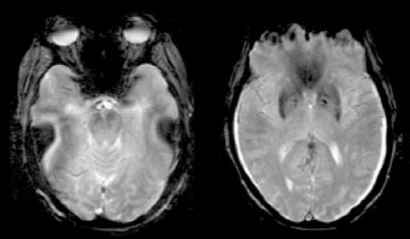 On the other hand, the chemical shift artifact itself can be exploited to clinical advantage to identify fat containing central nervous system lesions such as teratomas and dermoids (Fig. 52) and in differentiating fat from other high-signal T1 substances. Fig. 50. Chemical shift artifact depicted by the difference of 224 Hz between water and fat in a 1.5-T magnet. 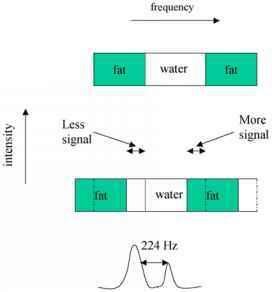 The shifting of fat to a lower frequency causes a thin band of signal loss at the fat-water interface and a similar band of high signal at the higher frequency water-fat interface. Fig. 51. Typical appearance of a thin band of signal loss at the rightward fat-kidney and corresponding brighter band at the leftward kidney-fat interface secondary to fat-water chemical shift artifact. Frequency encoding is in the left to right direction. Fig. 52. 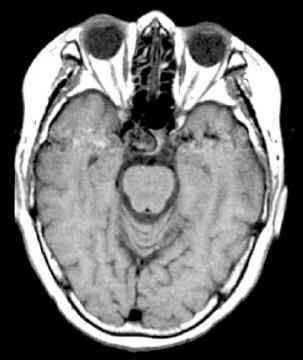 Axial noncontrast T1 image of a dermoid ruptured into the CSF space, again showing a thin band of signal loss at the bottom of the lesion as the frequency direction is in the anterior-posterior direction as opposed to left to right as in Fig. 51.
a discontinuity in a function as it jumps abruptly from one value to another. This applies to a step function in a Fourier series: the function has a constant value until it reaches the point at which it jumps suddenly to another constant value. When the Fourier series consists of such a function represented by a finite number of terms, broad oscillations will occur about the point of abrupt change or truncation. The oscillations are squeezed closer as the number of terms increases. In other words, the step-like changes in signal intensities cannot be accurately portrayed by the limited bandwidth of the Fourier series. On imaging, this is most evident during spine imaging by alternating parallel light and dark lines or ripples conforming to the anatomical contour owing to the abrupt signal variations from sharp edges such as fluid/soft tissue/bony interface (43) (Fig. 53). Image foldover or wraparound is caused by too small a field of view (FOV). To facilitate data reconstruction, the space outside the FOV is filled by identical copies of data from within. In other words, when the object is larger than the FOV, there will be spillover, appearing as wraparound (Fig. 54). To counteract this problem, one has to make sure either that the object to be imaged is completely included within the FOV or that the frequency- or phase-encoding data are oversampled, to create an image that is twice the size, with the portions of the image outside the selected FOV discarded. On gradient images, a "zebra"
Fig. 53. 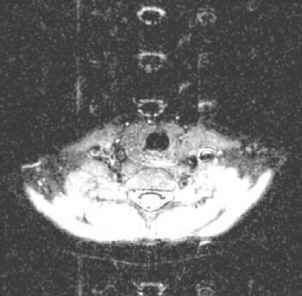 Sagittal T2 image of the cervical spine illustrating the multiple parallel lines of a Gibbs artifact that mimic a linear intramedullary increased signal abnormality. Fig. 54. 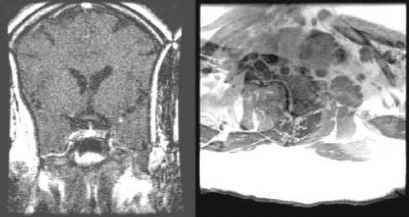 Foldover or wraparound artifact that obscures the normal anatomy in the brain (left) and cervical spine (right). pattern is created owing to interference between the aliased parts and the main image. Fig. 55. 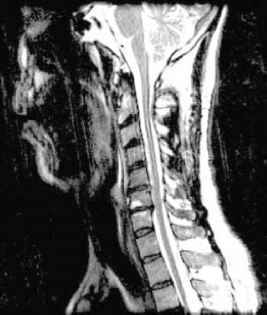 Ghosting artifact in the neck represented by parallel "ghosts" of pulsating structures such as the internal carotid arteries and CSF-filled thecal sac in the spinal canal. distortion of the image geometry that is particularly relevant in fat suppression imaging as this method depends on the frequency offset of fat and water within a homogeneous field. The inhomogeneous field broadens both the fat and water peaks, causing overlap and blurring. Ghosting can be caused by any motion or suboptimal pulse sequence design of gradient profile owing to flow-related phase shifts. Periodic motion from the respiratory or cardiac cycle or arterial pulsatile flow can cause displacement and mismapping of spins along the phase encoding gradient. On imaging they appear as a series of "ghosts" conforming to the shape of the structure of motion along the phase-encoding axis (Fig. 55). On the other hand, this artifact can be exploited in the clinical setting to identify aneurysms: their periodic pulsations will give rise to ghosting, thus differentiating them from calcification or bony structures (Fig. 56). 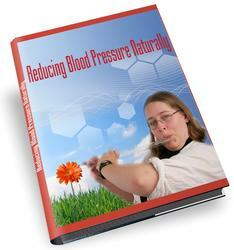 Various solutions to this issue have been proposed, including respiratory and cardiac gating, patient sedation, switching phase-and frequency-encoding direction, and fast scanning techniques. Flow artifact from CSF pulsation has previously been discussed. Fig. 56. 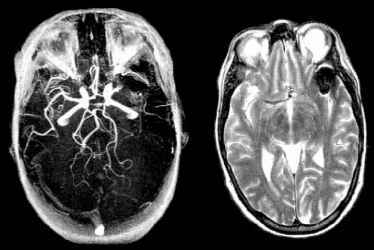 Pulsation artifact aiding in the diagnosis of a right cavernous carotid aneurysm on noncontrast T1 MR image. Fig. 57. 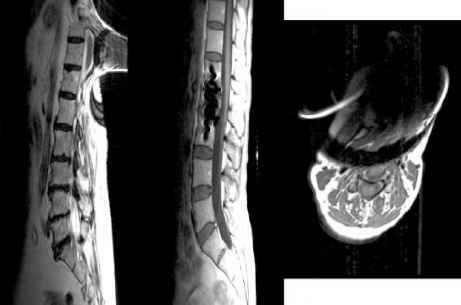 Artifacts from metallic hooks (left), surgical spine instrumentation (middle), and a denture (right) that distort normal anatomy on MR images. Fig. 58. Sequential depiction of an inverted U-shaped bright signal in dental artifact that goes anteriorly to posteriorly as the images progress from the skull base to the convexity (left to right, top to bottom). Fig. 59. 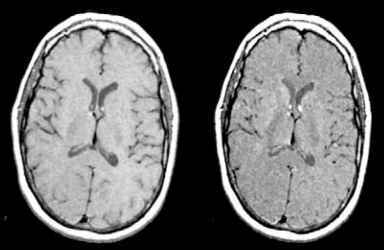 An apparent loss of flow signal of the left middle cerebral artery owing to an aneurysm clip artifact rather than occlusion of the vessel seen here on MRA (left) and T2 MR images (right). Fig. 60. 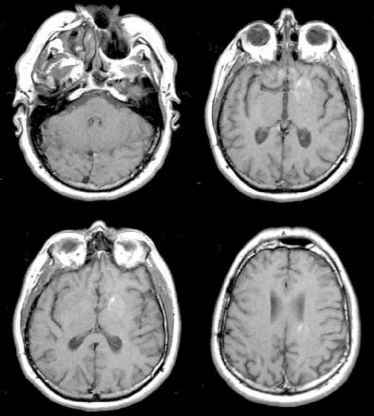 Gradient-echo pulse sequence showing loss of signal from susceptibility at the air bone interface as well as bringing out the mineralization signal loss of the basal ganglia bilaterally. that all patients be prescreened for potential foreign material within or on them before they are placed into the scanner. Gradient sequences are more sensitive to such artifacts than spin-echo sequences because of the lack of a 180° refocus-ing RF pulse. 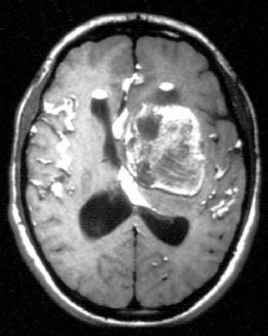 Again the susceptibility phenomenon can be exploited: a gradient sequence increases sensitivity to small foci of mineralization, cavernomas, and hemorrhage, because of their paramagnetic properties, which allows them to "bloom," appearing as an area of signal void with the extent of the area being exaggerated compared with the actual size of the abnormality (44) (Figs. 60-62).